As motorhomes become one of the fastest growing and most popular ways to take quality leisure breaks, what better way to get away to one of the many areas of outstanding natural beauty across the UK? Why not get away from it all to really relax & unwind, letting Easy-Lifter give you the freedom to use your scooter or bike to fully explore the locality without having to move your motorhome base every time you venture out. get quickly and easily to new areas, where your bike or scooter can then be used to explore at leisure. Simply wheel your bike up to the ramp, secure and away you go. To really make the most of the open-road lifestyle - if you are looking for a safe, secure and easy way to transport your scooter or bike to new areas for exploration, Easy-Lifter offers the perfect solution. As you would expect of our best selling product, the non-lift rack is designed to safely & securely transport scooters, road bikes or dirt bikes up to 200 kilos in weight. The rack is simple to use - fitted in less than 10 seconds and easy to attach with no tools required. It is small enough to store when not in use and comes with a ramp which is stored on the rack when not in use. 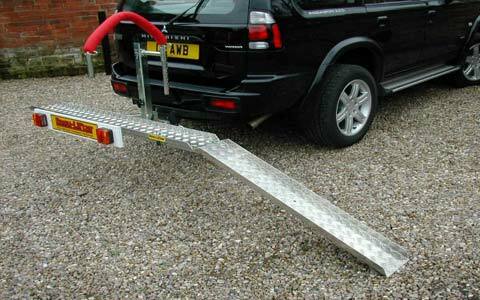 All of our racks fit onto a standard towbar with a special adaptor (supplied as standard) and come complete with a light board and an adjustable seat clamp. Whilst every effort has been made to ensure accuracy on this website, neither vista360 Limited nor Easy-Lifter Systems Limited can accept no liability whatsoever for any errors, inaccuracies or omission, or for any matter in any way connected with or arising out of the publication of this information. Any information shown are correct at the time of publication but should always be checked withEasy-Lifter Systems Limited, UK.